Last year we installed an indoor forest at the Annual General Meeting of the Northwest Regional Development Agency, with eco-films showing amongst the ring of native trees we'd put in place at the Manchester Central Convention Centre. 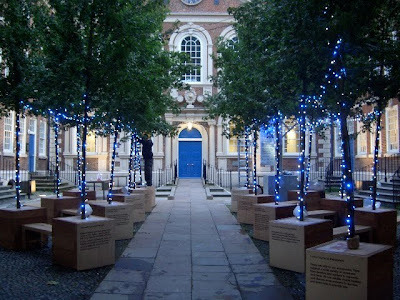 Now Creative Concern has delivered a second tree-based installation, this time outside the Bluecoat Gallery in Liverpool as part of the city's Capital of Culture year. The installation is made up of 16 mature maple trees, panels with quotations and reflections from famous writiers and a light and sound installation powered by a giant 'solar' tree which is an integral part of the installation. Sustainability and climate change, improving the ambience of the streets and even the health benefits of trees in the city will be explored as part of the work, which is in situ until September 14 and which will be there tomorrow as we run our Form>Wood conference on the importance of timber as a building resource. The project is a partnership between the Forestry Commission, NWDA, Regional Parks Xchange, Groundwork and the Environment Agency.